2019 Toyota Specials in SF Bay Area CA | Serving San Jose, Sunnyvale, Fremont, Mountain View, Milpitas. Tap yourself on the back for being a savvy car shopper! You have just found some of our best deals on new Toyota vehicles in the San Francisco, Bay Area. Hurry these deals won't last long, so click the vehicle you are interested in and start saving today. Not quite what you are looking for? Click on 'Request More Info' button to submit your question. Or, click on the Chat icon to get the answers you need instantly! Get $2,200 OFF MSRP on new 2019 Camry Hybrid LE vehicles ‡. Two Year No Cost Maintenance is included. See ToyotaCare for details. ‡ Offer applied to new 2019 Camry Hybrid LE vehicles and consists of $1,700 Dealer Discount and $500 Manufacturer Cash Back. Dealer Discount applies to new 2019 Camry Hybrid LE with model #2559 vehicles. 5 at this offer with VINs: KU007030, KU007246, KU007061, KU007334, and KU513226. Starting MSRP $29,454. Manufacturer Cash Back is available through Toyota Motor Sales USA, Inc and must be applied to transaction. Offer cannot be combined and is subject to availability. Does not include College Grad or Military Rebate. Prices do not include government fees and taxes, any finance charges, any dealer document processing charge, any electronic filing charge and any emission testing charge. Dealer document processing charge is $85. All vehicles are subject to availability, prior sale and limited to in-stock inventory only. Sales offers are not applicable to special orders. All Toyota Factory Cash incentives are in lieu of Toyota special APR or lease. Bonus Cash offers are only available through TFS and must be applied to special APR or Lease offers. Offers may vary based on final negotiated price and equipment chosen. Offers expire close of business date of publication unless otherwise stated. Displayed photos can be stock photos and may not represent actual vehicle. These Camry Hybrid offers expire 04/30/2019. Get $4,000 OFF MSRP on new 2019 Highlander XLE AWD vehicles ‡. ‡ Offer applied to new 2019 Highlander XLE AWD vehicles and consists of $3,000 Dealer Discount and $1,000 Manufacturer Cash Back. Dealer Discount applies to New 2019 Highlander XLE AWD with model #6953 vehicles - 5 at this offer with VINs: KS574382, KS944174, KS573174, KS915901, and KS580543. Starting MSRP $44,231. Prices do not include government fees and taxes, any finance charges, any dealer document processing charge, any electronic filing charge and any emission testing charge. Dealer document processing charge is $85. All vehicles are subject to availability, prior sale and limited to in-stock inventory only. Sales offers are not applicable to special orders. All Toyota Factory Cash incentives are in lieu of Toyota special APR or lease. Bonus Cash offers are only available through TFS and must be applied to special APR or Lease offers. Offers may vary based on final negotiated price and equipment chosen. Offers expire close of business date of publication unless otherwise stated. Displayed photos can be stock photos and may not represent actual vehicle. These Highlander offers expire 04/30/2019. Get $2,300 OFF MSRP on all in-stock new 2019 Yaris vehicles ‡. ‡ Offer applies to all in-stock new 2019 Yaris vehicles and consists of $300 Dealer Discount and $2,000 Manufacturer Cash Back. Starting MSRP $17,470. Prices do not include government fees and taxes, any finance charges, any dealer document processing charge, any electronic filing charge and any emission testing charge. Dealer document processing charge is $85. All vehicles are subject to availability, prior sale and limited to in-stock inventory only. Sales offers are not applicable to special orders. All Toyota Factory Cash incentives are in lieu of Toyota special APR or lease. Bonus Cash offers are only available through TFS and must be applied to special APR or Lease offers. Offers may vary based on final negotiated price and equipment chosen. Offers expire close of business date of publication unless otherwise stated. Displayed photos can be stock photos and may not represent actual vehicle. These Yaris offers expire 04/30/2019. Get $2,500 OFF MSRP on new 2019 Corolla vehicles ‡. ‡ Offer applies to in-stock new 2019 Corolla vehicles and consists of $1,000 Dealer Discount and $1,500 Manufacturer Cash Back. 3 at this price with VINs: KC212467, KP869072 and KP868576. Starting MSRP $21,918. Prices do not include government fees and taxes, any finance charges, any dealer document processing charge, any electronic filing charge and any emission testing charge. Dealer document processing charge is $85. All vehicles are subject to availability, prior sale and limited to in-stock inventory only. Sales offers are not applicable to special orders. All Toyota Factory Cash incentives are in lieu of Toyota special APR or lease. Bonus Cash offers are only available through TFS and must be applied to special APR or Lease offers. Offers may vary based on final negotiated price and equipment chosen. Offers expire close of business date of publication unless otherwise stated. Displayed photos can be stock photos and may not represent actual vehicle. 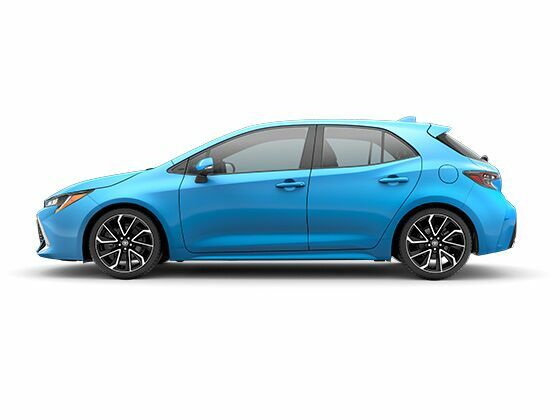 These Corolla offers expire 04/30/2019. Get $1,100 Dealer Discount on new 2019 Corolla Hatchback SE vehicles ‡. ‡ Dealer Discount applies to new 2019 Corolla Hatchback SE with model #6272 vehicles. 2 at this offer with VINs: K3016997 and K3046567. Starting MSRP $22,239. Prices do not include government fees and taxes, any finance charges, any dealer document processing charge, any electronic filing charge and any emission testing charge. Dealer document processing charge is $85. All vehicles are subject to availability, prior sale and limited to in-stock inventory only. Sales offers are not applicable to special orders. All Toyota Factory Cash incentives are in lieu of Toyota special APR or lease. Bonus Cash offers are only available through TFS and must be applied to special APR or Lease offers. Offers may vary based on final negotiated price and equipment chosen. Offers expire close of business date of publication unless otherwise stated. Displayed photos can be stock photos and may not represent actual vehicle. These Corolla Hatchback offers expire 04/30/2019. †† Sample Lease Offer applies to New 2019 Corolla Hatchback SE vehicles with model #6272. 2 at this offer with VINs: K3016997 and K3046567. $5,749 due at signing ($4,999 customer cash due after $750 Lease Cash). Lease Cash is only available through TFS and must be applied to special lease offer. Lease available only through Toyota Financial Services to well-qualified buyers with premium-rated credit. Lessee responsible for lease end mileage in excess of 12,000 miles per year at 15¢ per mile. No security deposit required. All Toyota Factory Cash incentives are in lieu of Toyota special APR or lease. No down payment required if qualified. Prices do not include government fees and taxes, any finance charges, any dealer document processing charge, any electronic filing charge and any emission testing charge. Dealer document processing charge is $85. All vehicles are subject to availability, prior sale and limited to in-stock inventory only. Sales offers are not applicable to special orders. Offers may vary based on final negotiated price and equipment chosen. Offers expire close of business date of publication unless otherwise stated. Displayed photos can be stock photos and may not represent actual vehicle. This Corolla Hatchback offer expires 04/30/2019. Get $2,500 OFF MSRP on new 2019 Camry LE vehicles ‡. ‡ Offer applied to new 2019 Camry LE vehicles and consists of $1,500 Dealer Discount and $1,000 Manufacturer Cash Back. Dealer Discount applies to new 2019 Camry LE with model #2532 vehicles. 5 at this offer with VINs: KU743452, KU748640, KU760965, KU232806, and KU236716. Starting MSRP $26,147. Prices do not include government fees and taxes, any finance charges, any dealer document processing charge, any electronic filing charge and any emission testing charge. Dealer document processing charge is $85. All vehicles are subject to availability, prior sale and limited to in-stock inventory only. Sales offers are not applicable to special orders. All Toyota Factory Cash incentives are in lieu of Toyota special APR or lease. Bonus Cash offers are only available through TFS and must be applied to special APR or Lease offers. Offers may vary based on final negotiated price and equipment chosen. Offers expire close of business date of publication unless otherwise stated. Displayed photos can be stock photos and may not represent actual vehicle. These Camry offers expire 04/30/2019. †† Sample Lease Offer applies to New 2019 Camry LE vehicles with model #2532. 5 at this offer with VINs: KU743452, KU748640, KU760965, KU232806, and KU236716. $4,499 due at signing ($3,999 customer cash due after $500 Lease Cash). Lease Cash is only available through TFS and must be applied to special lease offer. Prices do not include government fees and taxes, any finance charges, any dealer document processing charge, any electronic filing charge and any emission testing charge. Dealer document processing charge is $85. All vehicles are subject to availability, prior sale and limited to in-stock inventory only. Sales offers are not applicable to special orders. Offers may vary based on final negotiated price and equipment chosen. Offers expire close of business date of publication unless otherwise stated. Displayed photos can be stock photos and may not represent actual vehicle. This Camry offer expires 04/30/2019. Get $2,200 Off MSRP on new 2019 Rav4 LE Gas (non-hybrid) vehicles †. †Offer applied to new 2019 Rav4 LE Gas vehicles and consists of $1,200 Dealer Discount and $1,000 TFS Customer Cash‡. Dealer Discount applies to new 2019 Rav4 LE with model #4430 vehicles. 5 at this offer with VINs: KW008821, KD508114, KD017839, KJ007986, and KW011543. Starting MSRP $28,128. ‡ Customer purchasing a new, unused and unlicensed, in-stock inventory 2019 RAV4 Gas and financing Toyota Financial Services (TFS) at a non-subvened rate is entitled to TFS Cash if they meet the following conditions: 1. Customer is using non-subvened APR financing offered through Toyota Financial Services (TFS) (i.e. offer is not eligible with customer cash offers, TFS subvened, or retail financing done with financial institutions other than TFS). 2. Contract Date and retail date on the RDR are within the same program period. 3. TFS APR Contract term is less than or equal to 72 months. 4. TFS APR contract rate is non-subvened. 5. Amount is being applied as a non-cash credit to the amount being financed (i.e. no payments will be made directly to consumers). Prices do not include government fees and taxes, any finance charges, any dealer document processing charge, any electronic filing charge and any emission testing charge. Dealer document processing charge is $85. All vehicles are subject to availability, prior sale and limited to in-stock inventory only. Sales offers are not applicable to special orders. All Toyota Factory Cash incentives are in lieu of Toyota special APR or lease. Bonus Cash offers are only available through TFS and must be applied to special APR or Lease offers. Offers may vary based on final negotiated price and equipment chosen. Offers expire close of business date of publication unless otherwise stated. Displayed photos can be stock photos and may not represent actual vehicle. These Rav4 offers expire 04/30/2019. Get $3,000 Dealer Discount on new 2019 Highlander HYBRID XLE AWD vehicles ‡. ‡ Offer applies to New 2019 Highlander XLE HYBRID AWD SUVs with model #6965 - only 5 at this offer with VINs: KS055127, KS059156, KS060117, KS059906, and KS060777. Starting MSRP $45,030. Prices do not include government fees and taxes, any finance charges, any dealer document processing charge, any electronic filing charge and any emission testing charge. Dealer document processing charge is $85. All vehicles are subject to availability, prior sale and limited to in-stock inventory only. Sales offers are not applicable to special orders. All Toyota Factory Cash incentives are in lieu of Toyota special APR or lease. Bonus Cash offers are only available through TFS and must be applied to special APR or Lease offers. Offers may vary based on final negotiated price and equipment chosen. Offers expire close of business date of publication unless otherwise stated. Displayed photos can be stock photos and may not represent actual vehicle. These Hybrid Highlander offers expire 04/30/2019. Get $4,900 OFF MSRP on new 2019 Sienna LE vehicles ‡. ‡ Offer applies to new 2019 Sienna LE FWD vehicles and consists of $1,900 Dealer Discount and $3,000 Manufacturer Cash Back. Starting MSRP $35,298. Dealer Discount applies to select 2019 Sienna LE FWD with model #5338 vehicles. Prices do not include government fees and taxes, any finance charges, any dealer document processing charge, any electronic filing charge and any emission testing charge. Dealer document processing charge is $85. All vehicles are subject to availability, prior sale and limited to in-stock inventory only. Sales offers are not applicable to special orders. All Toyota Factory Cash incentives are in lieu of Toyota special APR or lease. Bonus Cash offers are only available through TFS and must be applied to special APR or Lease offers. Offers may vary based on final negotiated price and equipment chosen. Offers expire close of business date of publication unless otherwise stated. Displayed photos can be stock photos and may not represent actual vehicle. These Sienna offers expire 04/30/2019.